Two weeks from now, when your friends are like, "Let's go to Riverside and ride the Swiss Family Toboggan", you need to tell them: A) Six Flags New England hasn't been called Riverside since the '90s; B) that ride is terrifying even with an adult; and C) you can't because you're getting your learn on at Brew University's College of Craft Weekend, now taking reservations. The Orientation Masters of Craft Beer Dinner featuring a five-course pairing menu and a panel of craft experts there to answer questions about beer, life, relationships, and the ever-creeping fear of our own mortality. But mainly beer. 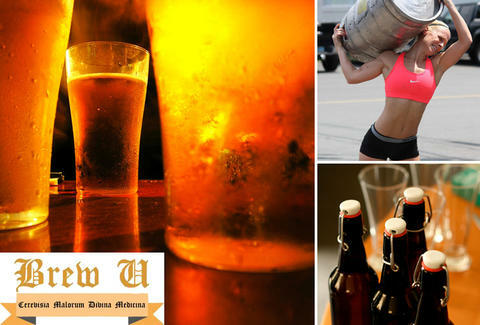 Courses like Craft 101, Homebrew Workshop, Beer Mixology, and Beer History Trivia. Beer Olympic events including Keg Carry, Flip Cup, Pong, and Pitcher Relay, so here's hoping you don't get matched up with Rich "El Guapo" Garces. On top of all that, they'll have a campus bookstore (with homebrewing kits, how-to-brew books, beer games, etc. ), a frat party featuring live music, and a VIP BBQ & Beer tent, so you can stuff yourself on booze/food, and become terrifying even to other adults.